The training program in Space and Applications – Department of Space and Aeronautics is a unique educational structure in Vietnam for senior technician and future scientists who can participate in the development of space science, space technology and its applications in Vietnam. This program is designed for students with superior math, physic and science skills and have a strong interest in space domain. The teaching contents are based both on a theoretical and experimental (practical) approaches and are prepared and taught in conjunction by Foreign invited and Vietnamese professors, with a strong French input. All subjects are taught in English. Besides, this training program also allows students to develop the inter-disciplinary skills: English, French, project organization and management, personal development (scientific writing, communication, creativity and entrepreneurship, and team working skills). They are capable to work effectively in multidisciplinary teams and in an international environment; take appropriate position in industry upon graduation and growing into leadership position, and also pursue scientific research or higher education. This Bachelor curriculum - Science and Technology - is managed by USTH and follow strictly the Bologna process (3 years with 180 ECTS). The ECTS is based on the principle that 60 credits represent the workload of a full-time student in one academic year. The student workload of a full-time study program in Europe amount in most cases to around 1500-1800 hours per year, therefore 1-credit is equivalent to 25-30 working hours (in class, practice, homework, assignment). 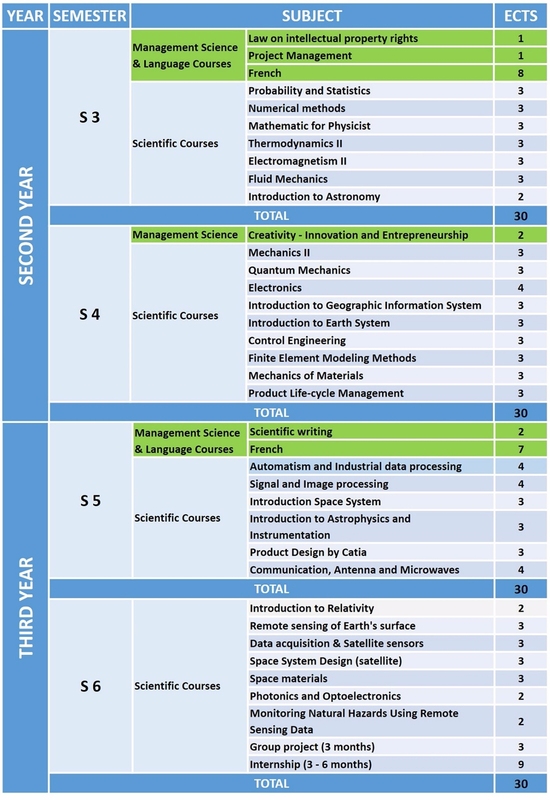 The first 2-semesters are constitute the foundation year, including the natural sciences (mathematics, physics, chemistry, and biology), informatics and English courses. 1. Solid professional knowledge to adapt to various jobs of researching theories, modeling ideas, designing and developing technology solutions, consulting and managing required systems in field of Space and Applications. 4. Conceiving, designing, implementing and operating systems/products/technical solutions in the enterprise and social context. Space Physics: Astronomy and Astrophysics.